Tripoli (Agenzia Fides) - 30 young Lebanese Christians took part in the training program entitled "The future of Christians in Tripoli: challenges and prospects for the new generation", organized by the St. Francis Convent of Tripoli-El Mina (Lebanon), in the context of the celebrations for the 800 years of Franciscan presence in the Middle East with the support of the International Secretariat of the Pontifical Missionary Union and in collaboration with the Pontifical Mission Societies in Lebanon. For more than 2 weeks, from 6 to 21 October, the participants in the course, lay and religious, belonging to the Maronite Christian community, as well as the Greek-Catholic and Greek-Orthodox, took part in educational activities and training sessions to deepen the spiritual, cultural, social and historical dimensions of the Christian faith lived and witnessed in the Middle Eastern context, also focusing on the problems of interreligious dialogue in the resolution of conflicts and on the role of Christians in civil society and in Middle Eastern political contexts. 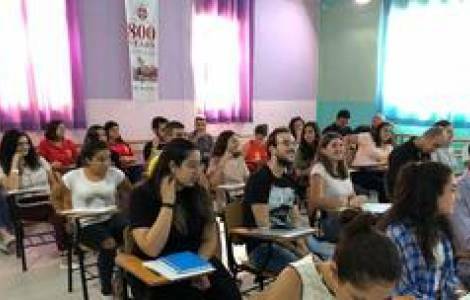 The 30 young people who took part in the course - reports a statement sent to Agenzia Fides - were selected through academic institutions and organizations such as the Apostolic Council of the Laity in Lebanon and Caritas Lebanon. The teaching activities were carried out by professors and experts, lay and religious, who work in the university and in study and training centers. During the working sessions, the young participants also fulfilled the task of developing proposals and projects aimed at "Promoting Tripoli as a city of peace, dialogue, culture and development". The projects will be implemented in 2019, together with new training, dialogue and cooperation activities.